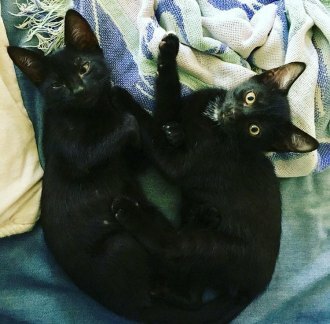 Home » Island Organizations » Kittens! 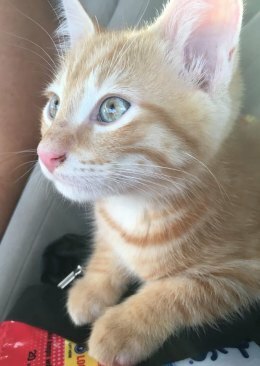 Mango is an Ocrakitty who found a forever home with Ocracoke resident Debbie Leoanrd. Now that we have your attention, Ocracats would like to say thanks! "Sometimes I am stunned by the amount of support, care, generosity and love bestowed upon Ocracats, (a nonproft that relies solely on donations to care for the feral cats on Ocracoke Island). Our year end financial report shows that our island feral kitties are beloved way beyond the fragile borders of this little island. And we send a humble and hearty thank-you to all who have contributed so generously to Ocracats. 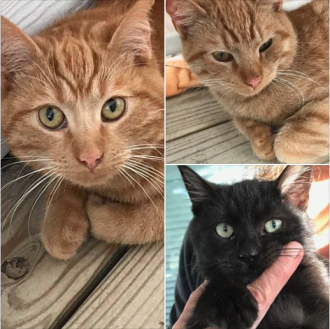 Ocracats most recent adoptees -- the orange boys moved to forever homes off the island, while the black one will stay on the island. Social media has definitely brought us to a broader audience and kept us in the minds and hearts of those lucky folks who get to visit our island paradise. When we have posted for help, whether it be for kitten adoption, soft food for the elderly ferals, clinic costs, or just to join the contest fun in locating Blackbeard’s cat, the outpouring always brings us more than we ever could have hoped for. We are incredibly grateful for all the cash dropped into our donation jars, donation checks sent, bags of food brought to us from visitors and all the tees, cards and calendars purchased in support of our mission. I cannot find enough words to thank you properly. Who can resist adorable kitty photos? We seem to be always championing some important cause, and kittens are often at the top of that list. This year, our best estimate is that we have found forever homes for close to 20 kittens (that includes re-homing at least 2 adult kitties). I am happy to report that our last batch who arrived in the fall are now adopted. Although kitten adoption is not our primary mission, these young ones fall into our care regularly. If you want to be on a list of folks to be contacted when kittens need homes, please sign up for our kitten adoption registry on our website. Cutest Ocrakittens ever!! These two are the official Ocracoke Current staff cats, Pepper and Skipper. And for those of us who live here and respond 24/7 with volunteer time, emotional energy, problem-solving skills, and rise to whatever occasion calls, you make Ocracats the special safe harbor we have become for the island feral kitties. So I’m in appreciation for what we, again and always, have accomplished this year. A special thanks to our mobile veterinarian, Laura Trent, who always gives way more than just standard medical care. We love you !